View movie page for Psycho. Director Gus Van Sant speaks about shooting in Death Valley and the state of American independent film. 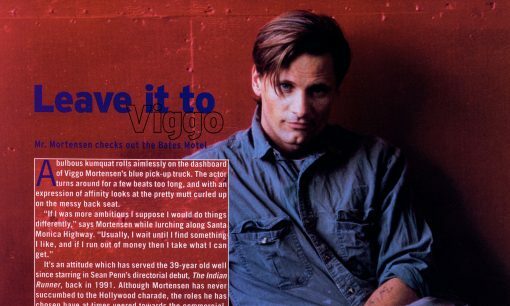 The most interesting part for Viggo fans comes in the last few paragraphs, where he discusses Psycho: "When we were shooting it, Viggo Mortensen and I were talking about the next one. We were going to do a black Psycho, a punk-rock Psycho... Viggo knows all the punk rockers, so he had some ideas about how to pull it off."